Alistair Maclean died in 1987, but what a legacy he left behind. 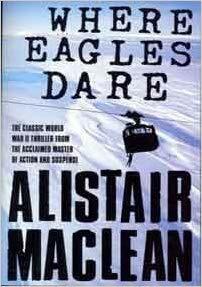 Alistair MacLean wrote the novel, Where Eagles Dare, at the same time as he wrote the screenplay. The 1968 film was shot on location in Bavaria and Austria. Metro-Goldwyn-Mayer produced this classic film with stars such as Richard Burton, Clint Eastwood and Mary Ure. Both the book and the film were a major success. Out of interest, the title comes from Act I, Scene III in William Shakespeare’s play Richard III: ‘The world is grown so bad, that wrens make prey where eagles dare not perch’. The plot has various twists and turns. During the winter of 1943 to 44 U.S. Army Brigadier General George Carnaby is captured by the Germans. He is said to be a chief planner for the Western Front. The Germans take him to Schloß Adler to be interrogated. The castle can only be accessed by cable car or by helicopter. A British Major, John Smith and a U.S. Army Ranger Lieutenant, Morris Schaffer (Clint Eastwood) are instructed on their mission by Colonel Turner and Admiral Rolland of Britain’s MI6. They are to be parachuted into Germany disguised as German troops with a team of commandos. Their mission – to rescue Carnaby before he can be interrogated. They are dropped by a captured German Ju-52 transport plane. Smith secretly contacts agents Mary Ellison and Heidi Schmidt. The other commandoes do not know of their existence. Heidi gets Mary a job as a secretary at the castle. Two of the commandoes are killed in suspicious circumstances, though Smith decides to continue the operation. He works closely with Shaffer and informs London of what is happening. The commandos surrender to the Germans and Smith and Schaffer are separated from the enlisted men. Smith and Schaffer quickly kill the Germans who are guarding them and then get their escape route ready. They ride on top of the cable car and then climb up a rope, lowered by Mary, into the castle. Carnaby is being interrogated by General Rosemeyer and Standartenführer Kramer. When the three captured enlisted men arrive, they identify themselves as German double agents. The plot then gets quite tricky to follow. But it is worth staying with it as it is ingenious. Where Eagles Dare by Alistair MacLean is a fantastic read and the film is a classic and one to watch over and over again. He is a great author in the style of Desmond Bagley and Hammond Innes. Buy Where Eagles Dare from one of the worlds greatest authors and you will not be sorry.